In the closer, Sherlock has to solve four crimes in succession, all under a set amount of time, and with the lives of hostages on the line. Literally on the line: Under duress, the hostages call Sherlock to relay messages fed to them by this great game’s mastermind, whom we’ve known from the start to be the ever elusive Moriarty. Some of the hostages live while some die, which is just as well to Sherlock, to whom they are of only secondary importance. He is unconcerned with performing any heroic resucing; he’s in this just for the thrill and to stave off boredom. In this regard, he is very similar to Moriarty, who finds perverse entertainment in playing games with the lives of people, with Sherlock as his chess opponent. We find out Moriarty’s not just some mastermind: He’s a “consulting criminal”–a nice counterpoise to Sherlock’s “consulting detective.” He sends Sherlock and Watson all about London to interrogate adulterous conspirators to a murder, take unnecessary photographs of a deceased makeover queen’s dog, and engage in one of the most ludicrous and messiest fight scenes ever at a planetarium, with 6-foot Sherlock trying to fisticuff the seemingly 12-foot criminal, “Golem,” and Watson bumblingly trying to help. Only after all that hullaballoo does Moriarty finally appear, and–gasp!–he turns out to be the seemingly innocuous gay IT guy from earlier in the episode who’d hit on Sherlock! Having wired Watson up to a bomb, he warns the duo not to overstep, before eventually letting them go. This turns out to merely be a fake-out as he returns to do away with our protagonists once and for all. With their lives at stake, Sherlock eyes the bomb Watson had just taken off, and…we’re cliffhung, or cliffhanged! Dear BBC,Thank you for the three-episode run of “Sherlock” this summer, with its brill writing and its kick-arse bromantic duo. I know that you will recommission another series (won’t you now? ); the real problem is when it’ll come into being. Steven Moffat is after all working on “Doctor Who.” So I suppose there’s only two ways to go about this: Either meld the two shows together or clone The Moff. I’ll leave the decision to you; you won’t after all have to rack your brain over whether to even recommission the show, as that’s a no-brainer. Thank you for your time, and God save the Queen! Ta! Every minute of “Game” left me unnerved in a good way. When the show had only ten minutes left and there was still a relative calm, I had an uneasy feeling that something abrupt was about to happen. And of course something did. The use of a big cliffhanger was of course strategic and a brilliant survivalist move by Moffat and Gatiss, as it ensures a recommissioning of the show. But damn it, the frustration of cliffhangers is magnified tenfold here because any new episodes–and any resolution to this cliffhanger–will be a year at least in the making. I must say I thought gay Jim being sociopath Moriarty was rather predictable. The IT guy’s insertion early on was so glaring (flamboyant, if you will) that it almost felt like the eventual twist was being broadcasted to us. (On a related note, I also saw Watson’s being taken hostage coming). I actually would have preferred to keep Moriarty’s identity hidden for much, much longer. There’s almost a sense of deflation with discovering his identity so early on in the game (though technically we are three episodes in out of three). But then, Moffat and Gatiss didn’t know coming in the lifespan of their creation, so there must have been a sense of “Pull out all the stops, as this may be our only chance at this!” mentality. Kudos yet again to Benedict Cumberbatch. This is the most vulnerable his steely Sherlock has been in the series. Sherlock’s human-ness shows through early on when, after engaging in a bit of a row with Martin Freeman’s straight man Watson, he starts moping like a little kid or a spurned lover. But this peep we get is short-lived, as Sherlock reverts to his usual clinically efficient and adorably insensitive anti-hero persona. 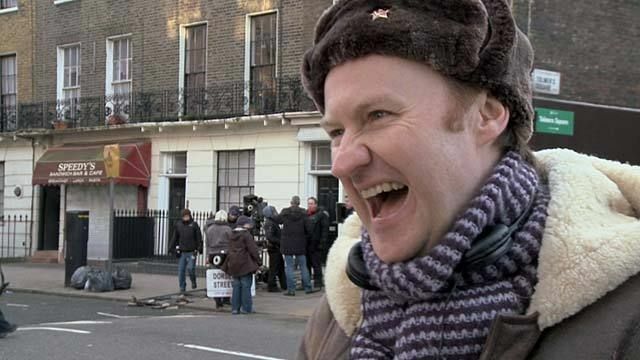 Great script, Mark Gatiss! The hat, though? Where's River Song and her fez-disintegrating gun when you need them? I like the echoes in “Game” back to the first episode of the series, with Holmes blogging about their first adventure, titling that entry “A Study in Pink.” I also like the return of social media–the texting, the blogging–which we saw prominently in the first episode. (I’ve read that the texting bits are an homage to the PS3 video game “Heavy Rain,” though I somehow can’t imagine Moffat being the video gaming type). “Game” works because it moves the series story arc along, as opposed to last week’s stand-alone episode. (I dislike filler episodes generally, as they serve only a dilatory purpose, stalling so as to stretch out a season/series). Now if that story arc can just keep on going. It’s been a short life for “Sherlock’s” first series. Fruit flies from Hoppledom-6 have longer lifespans than the three episodes that comprise the show’s short run (well, actually no they don’t, but it sure feels like it). It would be a crying shame if the BBC decides to call it “Game” over for this gem of a show. Recommission! Recommission! Recommission! As you may recall from an earlier post, I thought last week’s premiere episode of the BBC’s new series, “Sherlock,” was brilliance made manifest. So much so that I feared anything that followed would be outshone in comparison. My fear was indeed justified by this week’s “The Blind Banker,” though the episode was far from being dim. Penned not by Steven Moffat (whom you might have worked out by now I esteem very highly as a writer) but rather by Stephen Thompson, this week’s mid-series episode takes our modernized Sherlock and his associate Dr. Watson into the heart of a Chinese smuggling ring. There are, like in last week’s episode, a string of what seem to be suicides, but Sherlock isn’t, as we’ve come to expect, satisfied with that conclusion. Though the manner in which the murders were executed seem impossible (the attacks look like something Spider-Man would pull off), Sherlock soon demystifies them for us using his oh-so-masterful power of deduction (itself rather superhuman): They’re dealing here with deadly circus performers who are part of a Chinese gang, out to retrieve an ancient trinket stolen from them. And it’s not just any trinket: It has a whopping market value of nine million pounds. In the end, the leader of the gang mistakes Watson for Sherlock (the way in which this mix-up is set up is done well, with the breadcrumbs so stealthily planted earlier on). At “stake” are the lives not only of Watson, but also his lady friend, who faces death by an escapology contraption presented earlier in the story. Sherlock of course saves the day the smuggling ring, but a larger evil force looms, as Moriarty’s menacing presence reappears in the last few minutes of the episode. Benedict Cumberbatch and Martin Freeman continue to impress in their roles as Sherlock and Dr. Watson respectively, but here they plateau instead of sustaining a more upward momentum. (I have a vague sense of Freeman’s Watson being somewhat underused here). Perhaps it’s the sense that this is the in-between episode, a self-contained story that doesn’t necessarily move the story arc along. In fact, the elements of the episode themselves, though interesting, do feel like filler for the feature film length of the episode. The ciphers splattered throughout the episode as graffiti come across more as make-work. I am perhaps though being a bit too harsh and dismissive. Thompson’s is better than your average script. It’s just that it’s not as electrifying or refreshingly dynamic as “A Study in Pink.” It’s a more mundane script, very evidently crafted by another’s hand. (I really do wish one writer would write all episodes for a series, as inconsistency in tone is just so annoying; but that’s neither here nor there). I wasn’t in love with this episode, but that doesn’t mean I’ve fallen out of love with the series. Here’s looking to the series closer next week, written by Mark Gatiss. I’ve never cared much for Sherlock Holmes, nor crime fiction in general for that matter, but the Beeb’s new three-part series, “Sherlock,” has planted in me a newborn interest that’s set me to madly googling Arthur Conan Doyle’s master of deduction as a bit of catch-up. Co-creators Steven Moffat and Mark Gatiss seem to have a summer hit in their hands with their fresh and inspired take on the Sherlock Holmes story. And by the looks of the Moff-penned first episode, there’s much to justify the ratings: The show is funny, smart, and absolutely entertaining. Welcome to our gaff. 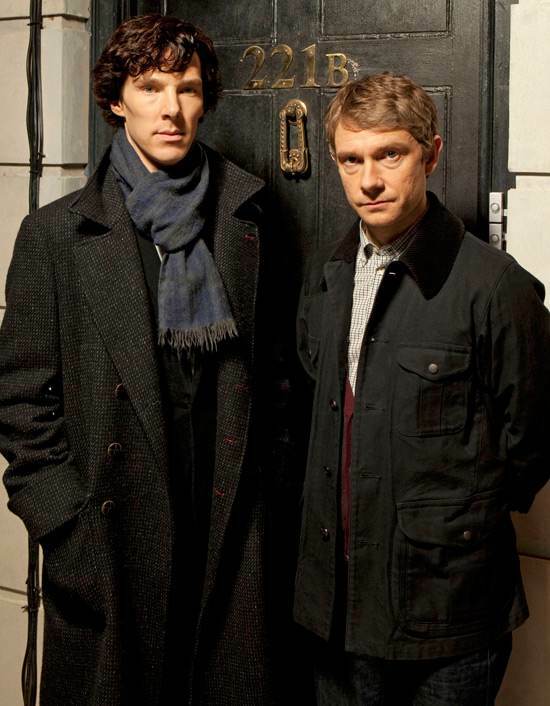 The bromantic partners in front of their Baker Street flat. It’s modern-day London, and “consulting detective” Sherlock Holmes (Benedict Cumberbatch) and former army doctor John Watson (Martin Freeman) become unlikely flatmates. Together they solve a string of suicide-like murders perpetrated by the most unlikely of murderers, a cabbie. Along the way, they get nonchalantly mistaken for lovers, do a bit of very exciting but dead-end-leading chasing, and clear up confusions about arch-nemeses. (We find out in a funny twist at the end that a sinister-looking fella who claims to be Sherlock’s arch-enemy is in fact his government muckety-muck brother, Mycroft). There’s so much more I can’t even begin to detail here with justice, which is a testament to just how rich Moffat’s script is. (In other words: Just go watch the damn thing!). Cumberbatch fits snugly into the role of the nicotine-patched, possibly gay, high-functioning sociopath detective with a penchant for texting. 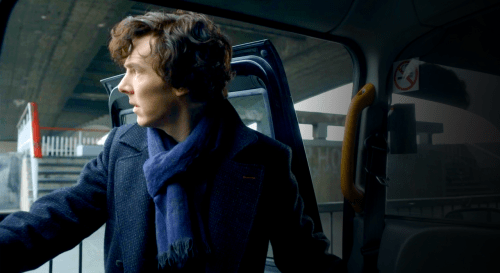 His deep-voiced Sherlock is distant yet somewhat adorable. There’s a darkness about Sherlock (he gets a kick out of complex crimes, and he exhibits a bit of inhumane cruelty when he tortures the dying cabbie into spilling the beans), the tone of which Cumberbatch gets just right. But there isn’t so much of that darkness so as to put the audience off. As Moffat describes it, Cumberbatch exudes an “imperious” and “Byronic” quality. Freeman’s Watson is just the perfect straight man (pun intended) to Cumberbatch’s likeable sociopath. Being a war veteran, this Watson shares Sherlock’s attraction to trouble and danger, which is the most intriguing aspect of their bromantic relationship. They are so well-matched (even Freeman’s height in comparison to Cumberbatch’s feels just right). In the lead-up to the broadcast premiere, there was some uproar over the gaying up of Sherlock and Watson, which I found baffling (the uproar, that is). Sherlock’s and Watson’s is a quirky and entertaining dynamic to watch. Just as with his omnisexual Captain Jack Harkness in “Doctor Who,” Moffat defies expectations by amping up the camp here, cheekily relishing in Sherlock’s sexual ambiguity. (I bloody love the Moff). The Moff is The Man. Comparisons to “Doctor Who” are inevitable, given that Moffat is that show’s executive producer and head writer, and Gatiss has been involved in “Who” in both a writing and acting capacity since its rebirth in 2006. With that said, I won’t be the exception in making my own comparisons. (Here I go). Just like the Doctor, Sherlock is almost impossibly astute. They’re both prone to talking fast, even shushing distracting people to allow him to think properly. In a way this is great preparation for Cumberbatch for the role of the Doctor, which according to recent barmy rumors will be left up for grabs by a departing Matt Smith (yet another load of rubbish from that ever so respectable publication, “The Sun”). But unlike the Doctor, Sherlock is very much human, very much fallible: In one of the episode’s funniest scenes, Sherlock thinks he’s got the deal with Watson’s sibling Harry figured out, except he fails to realize that Harry–short for “Harriet”–is actually female. Just one tiny, oh so important detail. (A nice twist involving siblings, just like with the Mycroft revelation). The thought of Cumberbatch becoming a future regenerated version of the Doctor sets my heart a-flutter, but thinking realistically, I can see why Moffat paired which actor with which show. Cumberbatch doesn’t strike me as looking quite as kid-friendly as Smith, who comes across as an instantly likeable and very cool adult with the charm of a child about him. Apparently, Smith had auditioned for the role of Watson, which thankfully he did not receive, as seeing two tall lads, Cumberbatch and Smith, together just wouldn’t feel right. I’ve already watched “A Study in Pink” twice; the second time with subtitles (Sherlock talks so bloody fast, I can’t make heads or tails of what he’s machinegunning!). Can’t wait for the upcoming two episodes, though I do worry that there will be a diminishment in quality, given that Moffat did not pen those scripts. Still, Moffat has set up in this introductory episode something just so engrossing that I find myself unable to not watch what’s to follow. Fantastic job, Moff.